The International Council on Clean Transportation (ICCT) has released its 2016 fuel efficiency ranking of 20 airlines operating nonstop flights between the mainland United States and East Asia and Oceania. Powered by BTS (Bureau of Transportation Statistics) data provided by the Dallas-based company Airline Data Inc, the study shows that Hainan Airlines and All Nippon Airways (ANA) ranked first in overall fuel efficiency. 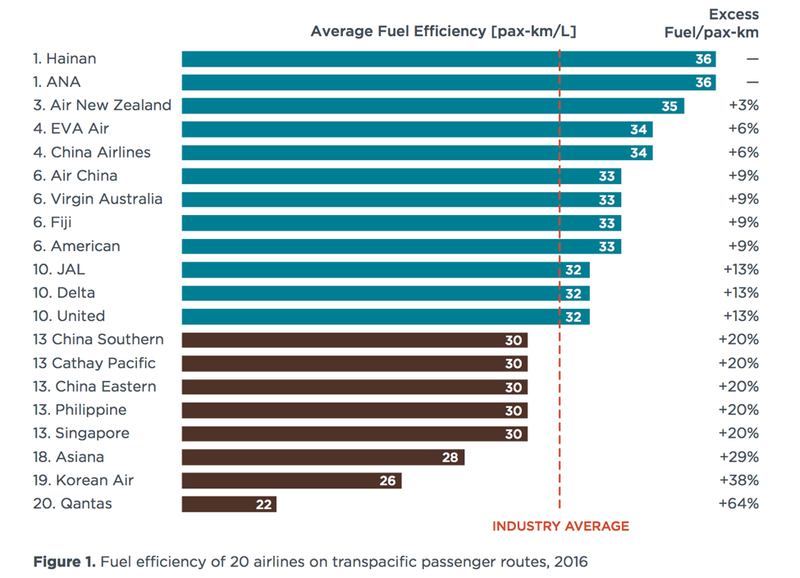 Qantas ranked last in overall fuel efficiency. As with ICCT’s study of U.S. domestic carriers’ fuel efficiency, the Transpacific Airline Fuel Efficiency Study is yet another example of the breadth of information that can be gleaned from data provided by Airline Data Inc.
Jeff Pelletier, Managing Director for Airline Data Inc says that ICCT’s continued use of Airline Data Inc products demonstrates the value of their data tools for research, for planning, for tactical strategies and for everything in between. The International Council on Clean Transportation (ICCT) has released its 2015/2016 fuel efficiency ranking of U.S. domestic airlines with results showing that a sharp increase in revenue passenger miles (RPM) drove both profits and fuel consumption on domestic operations up between 2014 and 2016 for U.S. airlines. For the fourth consecutive year, Dallas-based Airline Data Inc has played a critical role in the study by serving as the ICCT research team’s primary source for airline data. As the nation’s oldest airline data provider, the company has become an integral part of producing this annual report and has grown to be seen as a significant partner in the success of the study. 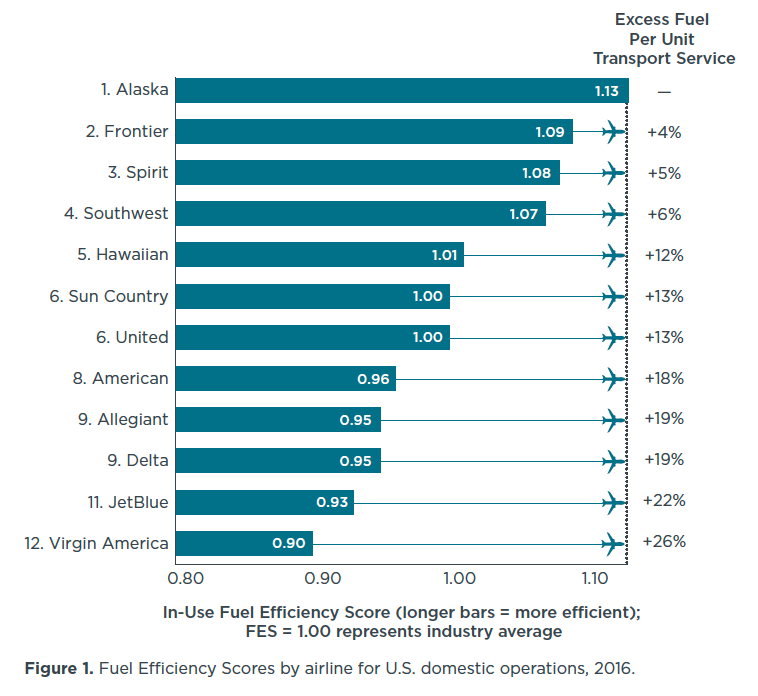 Alaska Airlines ranked first in overall fuel-efficiency among US carriers for seventh year in a row, while the gap between it and the least fuel-efficient carrier, Virgin America in 2016, widened slightly to 26%. Since 2012, the average profit margin for domestic carriers has increased nearly six fold, from 3% to 17% in 2016, thanks to lower fuel prices and higher ancillary fees. Compared to 2012, U.S. domestic carriers saved about $17 billion in fuel costs last year, about 20% of which were devoted to lower fares for passengers. Between 2014 and 2016, overall revenue passenger miles on domestic operations rose by 10% for U.S. carriers. That growth outstripped a 3% overall improvement in fuel efficiency (measured in RPMs per gallon of fuel), causing fuel use and CO2 emissions to jump by 7%. Jeff Pelletier, Managing Director for Airline Data Inc says that ICCT’s decision to use Airline Data Inc products year-after-year shows the power of their data tools and highlights the value and versatility of the information that his company provides.